The plug-in helps you to load the channel list, picon and EPG onto the Enigma2 box. Only EPG from us are supported. However, you should first adjust the "EPG ID" in your channel list to the EPG source. The TV-Archive player only works if the provider offers it. The VOD player is fully available for API Lines. For normal M3U lists the group titles have to be adjusted. For M3U lists, no IMDB data is available. From version 3.0.2 onwards, VOD and series will no longer be imported into the bouquets. These can be found in the VOD plugin! Important. 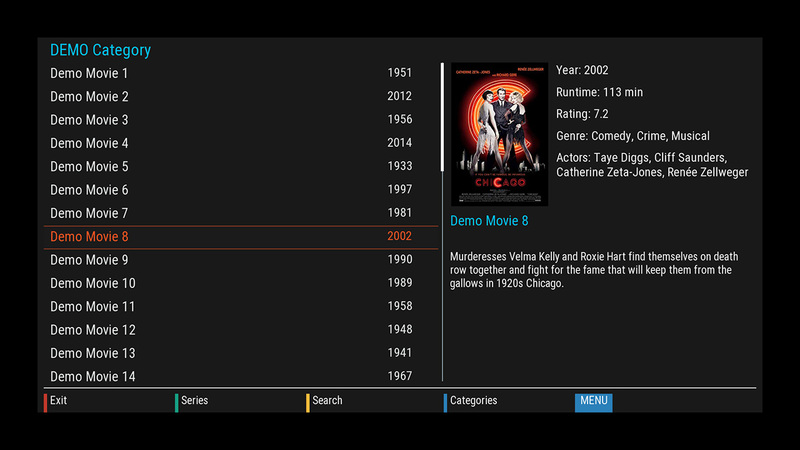 The VOD plugin uses a database to store the IMDB information. Depending on the amount of available VOD data, this database can grow up to 100 MB. It is strongly recommended to use external storage "/media/hdd" as workspace. 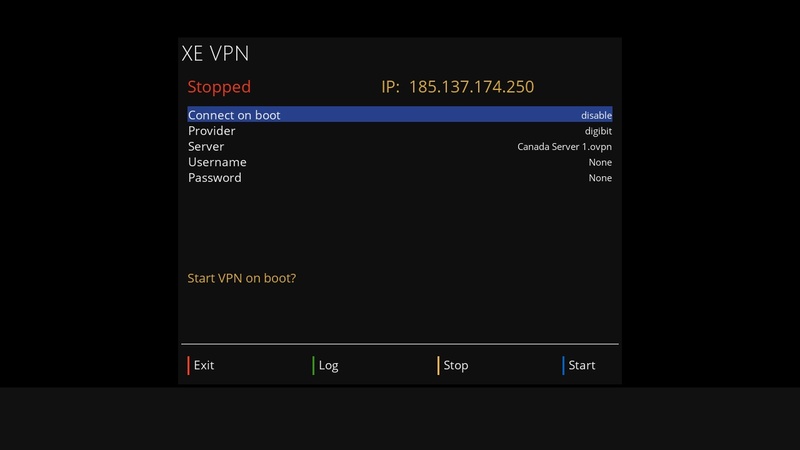 Connect to your box using an SSH or Telnet client like Putty. Be sure to check the date and time on your E2 box. For most images, this is provided by the DVB transponder. If the date and time are wrong, no VPN connection to the server can be established and the EPG data is not loaded. Activate multi-bouquet. Should be found under Settings. For most distributions, this option is already set. Activate Parental Control and enter a PIN. The code from the Xtream Editor can not be imported. You must specify this directly in the box. You will see an APP code. Link your Line- or List-ID with this code. Go to the editor in one of your playlists and paste this code. Press YELLOW to load the configuration and the bouquets to the box. Then the plugin is now connected to your playlist. Press BLUE to get EPG. Is the path where the plugin stores the VOD database. There, the files are also cached when loading the EPG. If you are using a USB stick as storage, make sure that it has been initialized correctly. 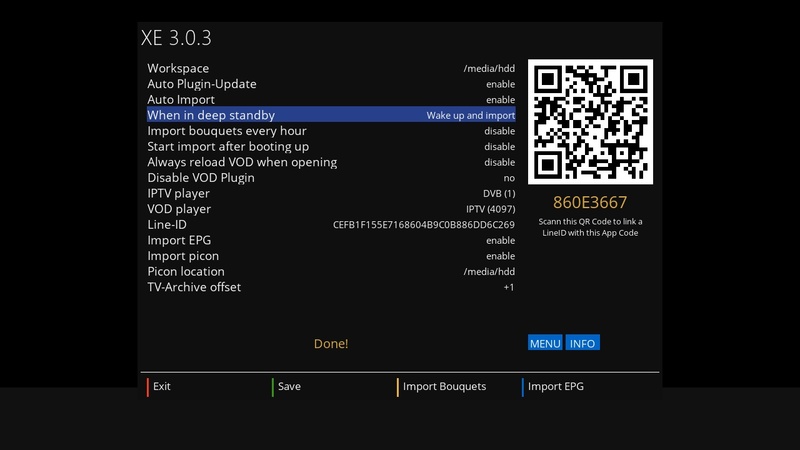 When this option is enabled, your bouquets and EPG are loaded daily at a certain time automatically. This setting is recommended when you turn off the box completely. Auto Import only works in standby. If this setting is enabled, the VOD data will be updated each time the VOD plugin is opened. Depending on the amount of data and the performance of the box that may take a while. In the VOD plugin you can press the key "4" to update the data. This deactivates the VOD plugin. The movies and series are loaded in the bouquets. This setting allows you to choose which player E2 will use for your IPTV streams. The additional plugin "serviceapp" will be installed if possible. This setting allows you to choose which player E2 will use for your VOD and TV-Archive streams. The additional plugin "serviceapp" will be installed if possible. This is the time shift from UTC to the time zone of the provider server. If you have problems with the import, you might find the reason there. Is very important for our support. You can then distribute the DVB-C, DVB-S and DVB-T channels in different groups. 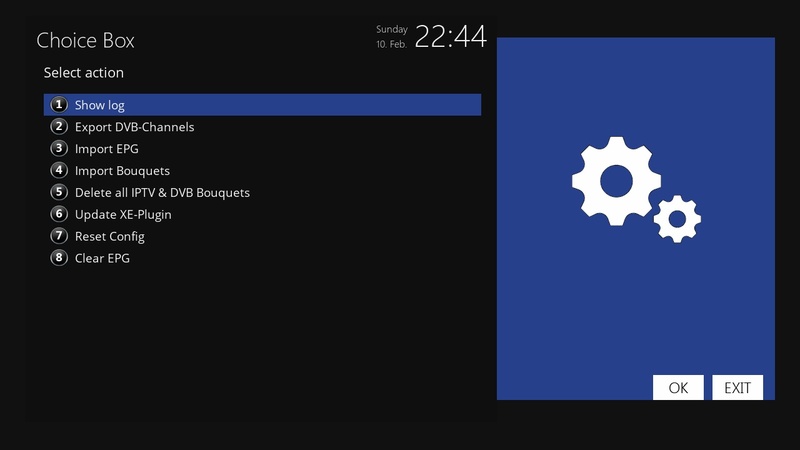 This allows you to insert DVB channels into the group of IPTV channels. After the next import, they will be sent back to the box. This deletes all bouquets. Even those who did not create Xtream Editor. So handle it carefully. When a new version of the plugin is released, you will receive a message after the import. You can then click MENU and select this option. The plugin will be updated automatically and the box will be restarted. The EPG.dat and cache will be deleted. Channels with catchup service are now marked with an "[+]" or "*" in the channel list. 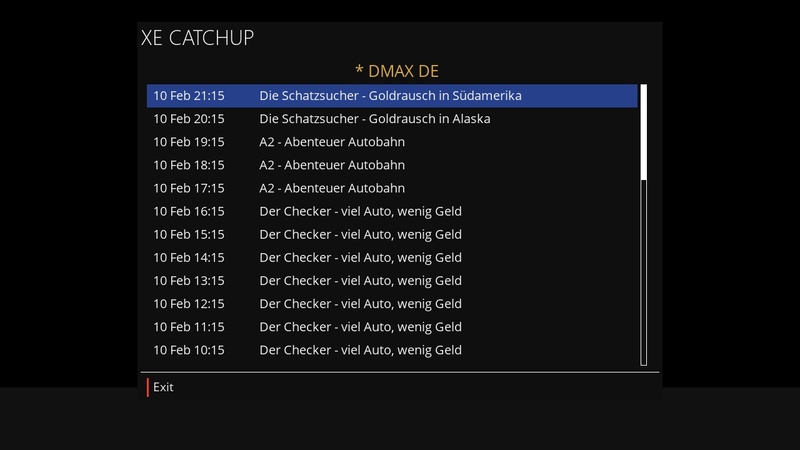 Even with TV-Archive channels, our XE Media Player is used. Please read the instructions to find out how to use FFW and FRW. 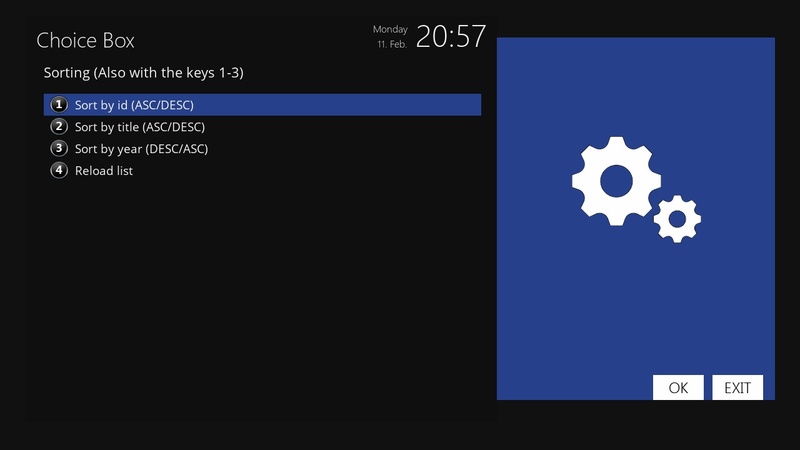 On your remote press Menu > Setup >Usage & GUI > Hotkey setup. Press red key on your remote (the key is optional but i thought red button was best) > in "Plugins" select "XE CATCHUP" > press green button to save > exit. Please remember! None of our plugin plays the streams. We only provide the links and controls. If you have problems playing, you should define an alternative player in the XE Downloader. Function of the keys as with the standard media player. The buttons PLAY, PAUSE, STOP, FRW, FFW are identical to the standard player. Please keep in mind that not every player supports these features. Press the LEFT or RIGHT buttons to open the Seekbar. There you can again select with the keys LEFT and RIGHT desired point and confirm with OK. 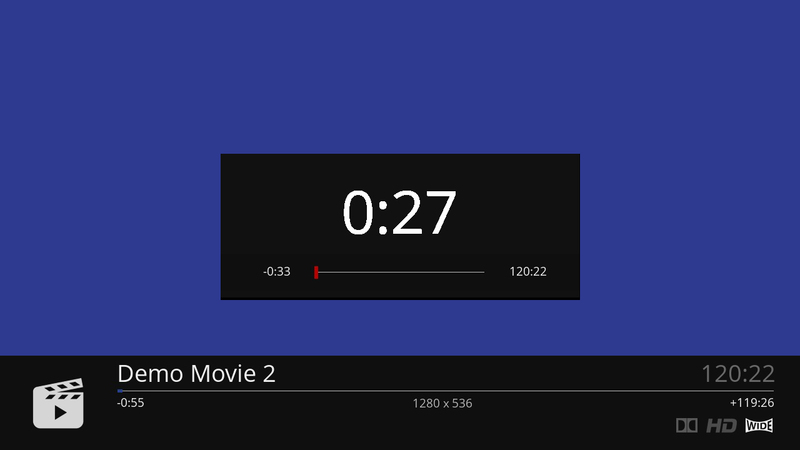 This custom media player is available for VOD and TV-Archives. Not for IPTV. The prerequisite is that you have a valid subscription to one of these providers. Many IPTV providers block access with a VPN connection. Please, before you buy a subscription at one of these VPN providers, inform yourself if this works for you. The plugin is free for all Xtream Editor customers. So you need a subscription with us. You should also know that a VPN connection may slow down the internet connection. Use Google Search to inform you. Go to the "Sever" section and click "OK" on the remote. Depending on the provider, it may take a while for the first setup to show the server list. Select a VPN server there. Navigate with the remote control to the Username section. Click "OK" on the remote. Enter your username from your VPN provider. Repeat the same with the password. Click on the "BLUE" button on your remote. Now our plugin tries to connect. 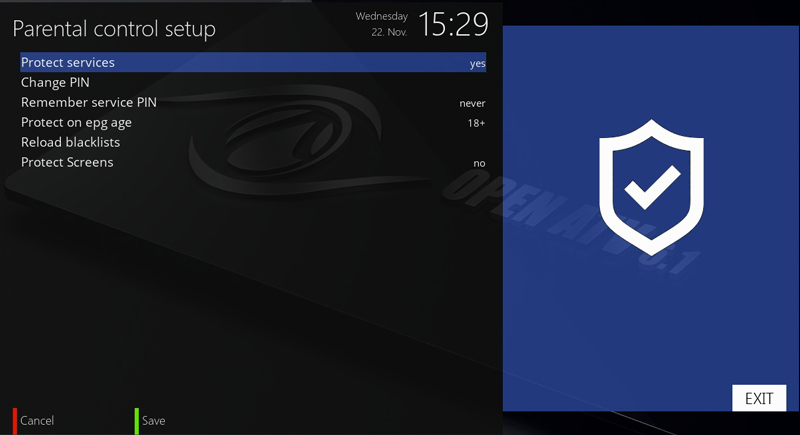 After a few seconds, you will see the status and your IP address in the upper area. If it does not work. Click on the "GREEN" key and analyze the log. There you may find the cause of the failed connection.